Conversation with James Whelton, Managing Director of NEU Professionals, international recruiting company involved in the professional relocation of European medical professionals. James K. Whelton is the Managing Director of NEU Professionals, an international recruiting company established in the United Kingdom which is involved in the professional relocation of European medical professionals (especially nurses) to the United Kingdom’s hospitals. In the following interview, Director Whelton tells us about the profiles NEU Professionals is currently recruiting among the different European countries, NEU’s interest for Italian nurses as well as its fruitful professional relationship with AlmaLaurea. “Our success in Italy has, in part, been down to the excellent services provided by AlmaLaurea who helps us communicate with thousands of nurses on a regular basis. It would be important even in the contexts of other European countries to strengthen services aimed at the support of recent graduates in finding job opportunities” Director Whelton says. What are the main activities of your company, NEU Professionals? “NEU Professionals Limited is an international healthcare recruitment company that supports medical professionals who wish to relocate to the United Kingdom. In particular, we focus on assisting qualified nurses from the European Union who have an ambition and desire to work within the UK National Healthcare System. Our Client base consists of a number of NHS hospitals all of whom offer attractive relocation packages to support candidates”. In which countries are you currently recruiting medical professionals? “We have established representatives ‘on the ground’ in Italy, Poland, Portugal, Romania and Spain. Our team is ready 24/h to provide advice and support to all candidates who are interested to relocate either immediately or at some point in the future. From an early stage, we advise on the practical steps required to progress with registration at the UK nursing council (NMC) - the application and certification process, in fact, requires much attention to detail”. To what extent the professional qualifications in the healthcare systems are similar among the different European countries? “Nursing qualifications are very similar across the European Union with nursing degrees being of a 3-year duration (in Spain generally 4 years) and the UK NMC fully endorses such qualifications. Historically, the NMC have issued the “right to practice” (the so-called PIN) relying on the employer to establish the applicants standard of verbal and written English. However we know that more formal English testing will be introduced in the next few months which will require applicants to have their English skills tested, which will be an additional step in the process of becoming a registered nurse in the United Kingdom”. To what extent you consider soft skills as important in the process of recruiting the proper candidate? “There is no doubt that qualified nurses from the European Union remain in high demand and we always try to match the expectations and desires of the nurse with job vacancies available. A nurse who relocates will face many challenges including cultural changes, a new language to master, and most importantly understanding their new duties and responsibilities. For these reasons even soft skills like flexibility and the capability to adapt to different contexts are very important”. And what about the Italian candidates you have met? 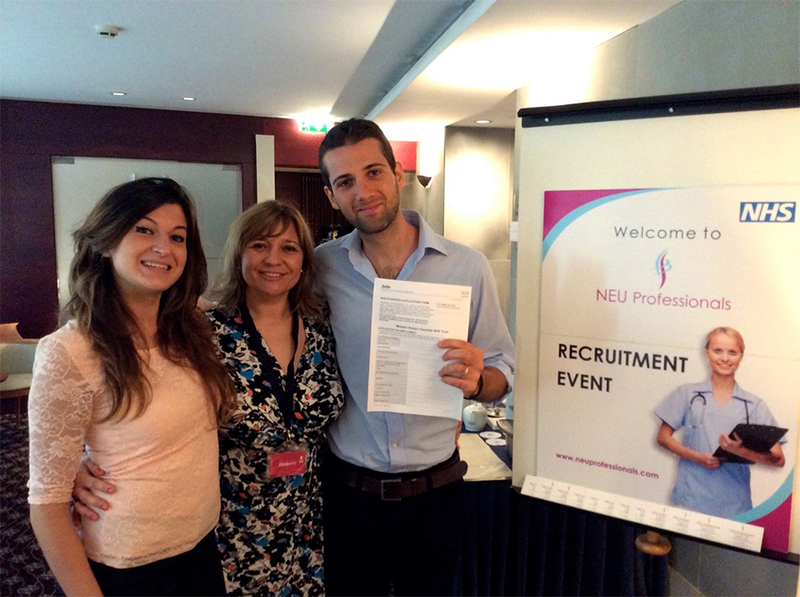 “NEU have held four recruitment events in Italy so far this year and the quality of the candidates have been exceptional so Italian nurses are very popular with our clients!”. What is the value added by the Inter-University Consortium AlmaLaurea’s services for a company like yours? “Our success in Italy has, in part, been down to the excellent services provided by AlmaLaurea who helps us communicate with thousands of nurses across Italy on a regular basis. We have the ability to reach out to nurses who have just qualified and those who may have graduated 2 or 3 years ago. Such support in other countries does not seem to exist and often universities (both public and private) do not see the commercial benefit of supporting graduates in finding job opportunities”. Thank you for your kind answers to our questions, Director Whelton. Is there any concluding remarks for our readers? “We have no hesitation in recommending the services of AlmaLaurea and in particular their ability to encourage graduates to strongly develop their CV’s which are always of an excellent standard!”.